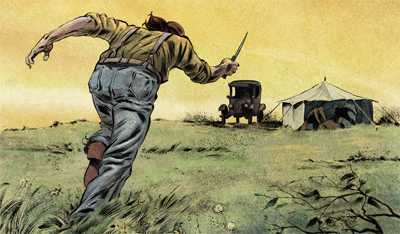 We’ll be supplementing our coverage of the episodes with some additional materials – mainly novels and comics and films. This is one such entry. This is actually supplementary to the episode Elementary, Dear Data. 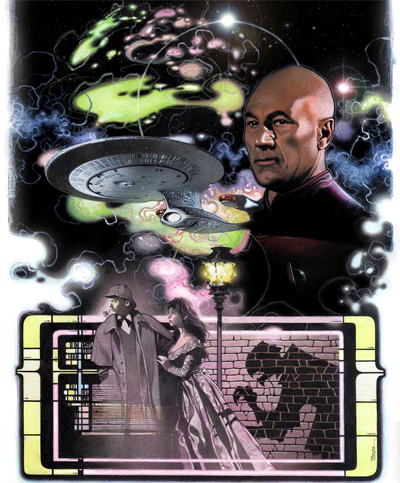 So, pairing up Data’s Sherlock Holmes with Redjac’s Jack the Ripper should make for a decidedly pulpy adventure. Unfortunately, the end result is a little generic and unsatisfying. For a show about a serial killer and the FBI’s Behavioural Analysis Unit, Hannibal is often surprisingly deep. That’s not much of a surprise, given the quality of the staff working on it, but the show is absolutely stunning meditation on identity and personality. In a way, that’s one of the smartest things about Fuller’s first thirteen episode season, building on the foundations set by Thomas Harris to construct something that fits quite elegantly while remaining its own distinct entity. Relevés is the penultimate episode of the first season, and the point where – having used Roti to clear away some of the clutter – the show starts tying up a lot of those loose ends. Perhaps one of the most impressive things about the episode is the amount of suspense that Bryan Fuller and his staff can wring from the set-up – despite the fact that we know how this story ends, Hannibal manages to engage us so completely in the telling that what we already know seems almost irrelevant. 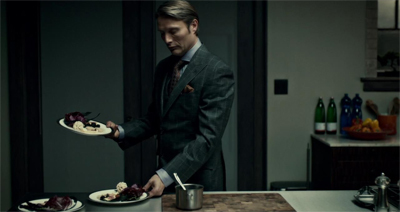 Buffet Froid is the most strikingly horrific episode of Hannibal to date. Of course, the show is very much a horror story and enjoys its fair share of grotesque imagery. This is the series, after all, that gave us the makeshift angels, the do-it-yourself cello and the human totem poll. However, Buffet Froid plays most obviously on the imagery and iconography of horror. This is the episode where people have no faces and skin comes off at the slightest touch and the serial killer is waiting for you under your bed. As you might imagine for a show with such complete control of its own atmosphere, Buffet Froid works very well indeed – providing what might be the most horrific episode of the show to date. We’ll begin with a reign of terror. A few murders here and there. Murders of great men, murders of little men, just to show we make no distinction. We might even wreck a train or two. Just these fingers around a signalman’s throat, that’s all. The Invisible Man is a classic, sandwiched between James Whale’s celebrated monster movies – Frankenstein and Bride of Frankenstein. The movie was renowned at the time for its special effects, which still hold up remarkably well on the snazzy new blu ray issued by Universal Pictures. However, the film itself is still fantastic on its own terms, featuring a great leading performance from Claude Rains, a witty script and some fantastic direction from Whale. 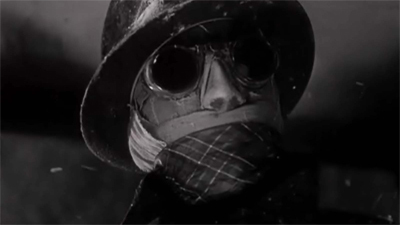 I think it’s also quite wonderfully telling that The Invisible Man manages to feature the story of simultaneously the most human and the most inhuman of these Universal Monster Movies. Severed is a distinctly American horror story, feeling like something of a companion piece to author Scott Snyder’s American Vampire or even the work of Stephen King. Set during the dark days of the first world war, it’s an exploration of the darker side of the American Dream, to the point where it’s quite telling that our narrator refers to the anonymous villain merely as “the Nightmare.” It’s rich, sophisticated and atmospheric storytelling, a modern American fable co-written by Scott Tuft and with bone-chilling illustrations from Attila Futaki that are sure to unsettle.